Data connection library, wikis and blogs, and enterprise social networking are just a few of the unsung heroes in SharePoint. that SharePoint has both wiki and blog functionality built in? Did you know that SharePoint can help you collect information on what people are searching for and whether those queries return results in search? Or did you know that you can use SharePoint search to return results right within Microsoft Office? Maybe you did, or maybe you didn't. You have probably used the thesaurus or the Lookup function in Office at one point or another. This specific feature uses something called the Research Task Pane within Microsoft Word, PowerPoint and Excel. 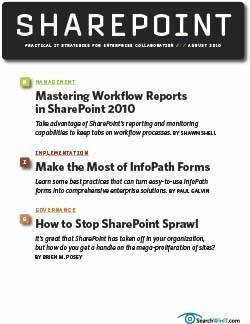 This feature is available in Microsoft Office SharePoint Server (MOSS) 2007. Right click on any part of a document, with or without text. Click the Lookup option from the context menu. Pick Research Options from the bottom on the Research Task Pane that appears. Click the Add Services button, and type in this url: http://[server_ name]/_vti_bin/search.asmx. In it, [server_name] is the address of your MOSS 2007 server. Then click OK to close the Add Services dialog. The next time you perform a “lookup,” your SharePoint application will be listed in the dropdown list of research sources available. 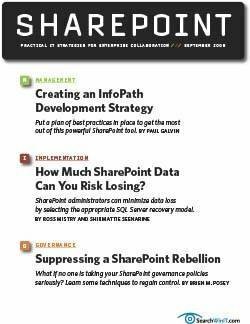 Many SharePoint users complain that search within SharePoint stinks. Unfortunately, no one ever seems to know how to fix it. Although the answer will be different from one organization to another, one underutilized feature that can help is search analytics. It can tell you what terms are used to search for content, what queries return no results and what queries produce results with no clicks. You can get Site and Site Collection analytics in the Site Settings menu of a Site or Site Collection, depending on what level you want data. For search analytics, you’ll need to visit SharePoint Central Administration site in the Search Settings section. 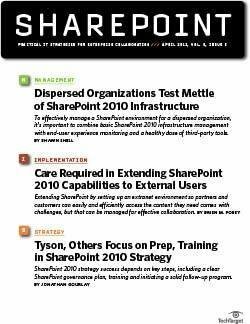 This feature is available in Microsoft Windows SharePoint Services (WSS) Site/Site Collection and MOSS Site/Site Collection and search. Really Simple Syndication, or RSS, has been around since the late 1990s. Its original use was to create a simple, standardized method for syndicating news content to a broad audience. But RSS has broader application than just news. 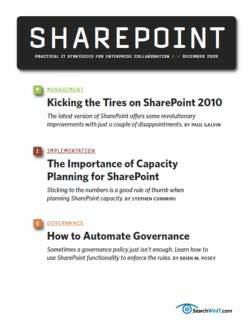 In fact, everything in SharePoint can be syndicated through a standard RSS feed. 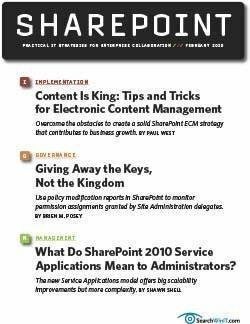 This means that, using an industry standard format, you can make content within SharePoint available to applications across your enterprise. This is particularly useful if you want to surface content from lists or libraries in Outlook 2007 because Outlook has a built-in RSS feed reader. Or, if you have a public website, you can provide an automated news feed without any programming. This feature is available in both WSS and MOSS. 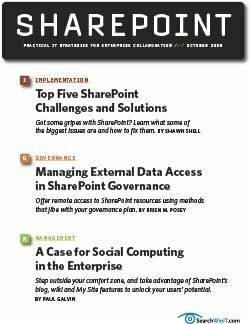 The Business Data Catalog, or BDC, allows SharePoint to access structured data from various enterprise systems. That could be a SAP implementation or just a database inside of SQL Server or an Oracle server. Any data repository that you can connect to with a SQL call or a web service is available to the BDC. 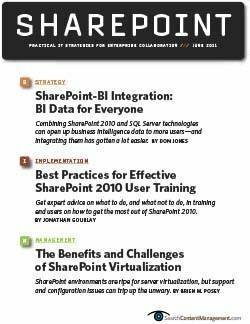 Using the BDC, you can then expose that data to SharePoint’s search engine. This enables users to find data in a database or an enterprise system by simply submitting a query much like they do for content. Then you can retrieve search results and individual records through prebuild web pages in SharePoint. In addition, the BDC allows you to include this data in list columns or feed profile information about users from your HR system. MOSS Enterprise is the only version that has this feature. Where’s that database and how do I connect to it? These are two common questions for power users and non-power users alike. Each type of user would like data in a database for local analysis in Excel, but they don’t have the knowledge to find the data. Further, you don’t necessarily want every user a creating unique connection to your data. The data connection library seeks to solve some of these challenges by creating a trust and managed location for storing pre-build data connections. 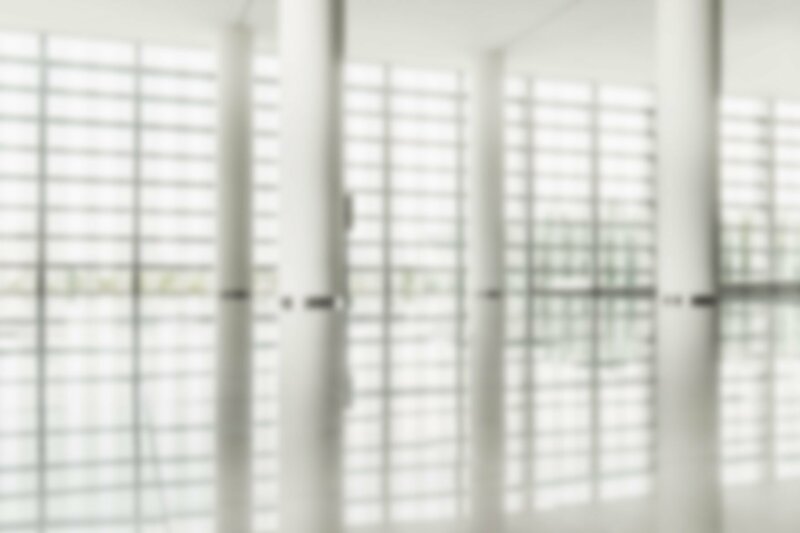 These connections can be created by a trusted and knowledgeable member of your team. They can then be uploaded and used by anyone who has access to the library. You can find this feature in MOSS only. Wikis and blogs tend to be underutilized and poorly understood by many organizations. But they represent a great leap forward in helping to distribute information and content. Blogs and wikis have different approaches to authoring content, but both solve a critical challenge in the enterprise— how to enable knowledge workers to easily share information. On blogs, individuals produce content that can be easily shared and commented on by others. Wikis are a more collaborative and democratic method for group content contribution. Blogs are good for situations where an expert wants to share information and knowledge. Wikis are better when a group must collaborate to produce a single article. 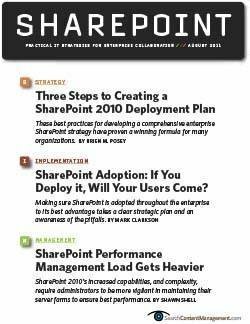 In either case, SharePoint makes both constructs easy to create, update and disseminate based on your needs and requirements. WSS and MOSS users alike can take advantage of this feature. Who is on your team? Do you know someone in HR who could introduce you to the vice president in that group? What has your corporate expert on Active Directory been working on lately? These are all questions that the social networking features of SharePoint can help answer. SharePoint keeps track of multiple profile attributes of users within the system. You can indicate that you want to “follow” others inside and outside of your department—those of you who use Twitter will understand this concept. This means if Jane posts a blog entry on her My Site, and you’re following her, then you’ll be notified about the new entry. If you need to be introduced to people in a different department, perhaps you can look them up using people search and then browse other people in their group to see if you have any contacts. And all of this functionality is provided out of the box with SharePoint. This is a MOSS-only feature. 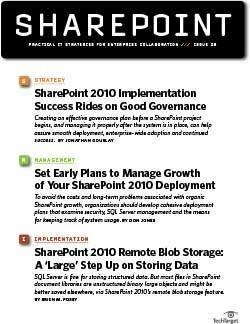 My Sites are a feature in SharePoint that allows individuals to “own” their very own site collection. There are downsides to this feature. Everything from the violation of data security policies to excessive consumption of storage can be side effects when end users have loads of control over a site collection. If you can mitigate the challenges, though, My Sites can be the key to enabling user-directed personalization. They provide the flexibility to give end users the freedom to surface content and applications they chose themselves. They even have the ability to create and manage their own collaborative sites. You can find this feature in MOSS only. This is a standard web part that ships with MOSS —but not WSS. 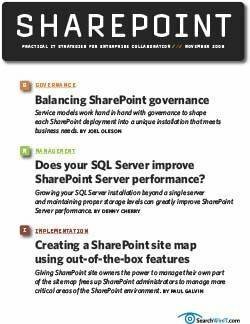 It allows you to query content across a SharePoint site collection and display it as navigation. The web part does not use search. 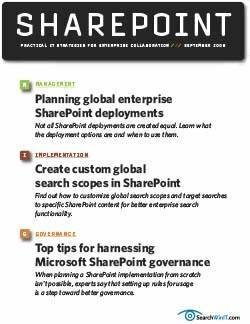 Rather, it uses the native SharePoint Collaboration Application Markup Language, known as CAML, to find content matching the criteria you’ve provided. The biggest advantage to the web part is that you can radically customize how the results are displayed. This allows organizations a great deal of flexibility when using this web part. For example, you can use the web part to query the Site Collection for all news items across multiple department sites and display them like navigation elements on the home page of an intranet. Again, this one is a MOSS-only feature. SharePoint exposes nearly all of its functionality through SOAP-based web services. 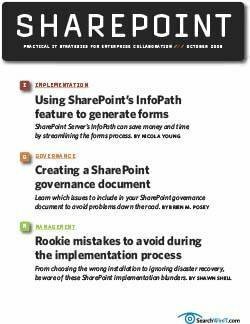 Although you’ll have to be a developer—or someone who understands web services—to take advantage of this feature, it can provide a standardized way to send and retrieve data from SharePoint. For example, suppose you want to get someone’s first and last name or the name of that individual’s manager for an expense approval process using an InfoPath form. You can leverage the UserProfile web service from SharePoint to submit a query for that individual and retrieve his or her profile details. In this example, no programming is required. Plus, it will yield a ton of information that can be used in processing the expense report. 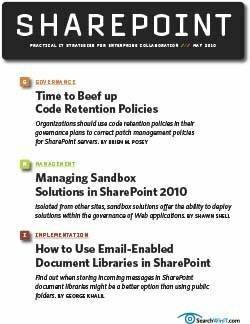 WSS and MOSS each have SharePoint Web Services as a feature. Which one of these features have you ignored, or which one didn’t you even know existed? 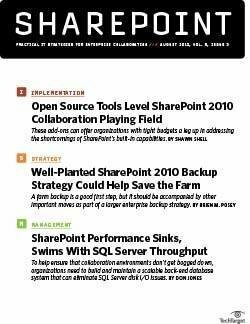 Don’t worry—you can’t really be faulted for missing a few of these because SharePoint is a vast product. 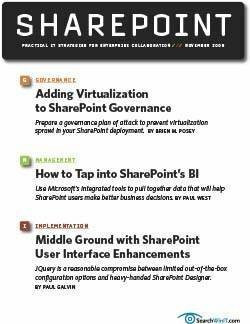 But now that you know, perhaps you’ll be able to get additional value from your SharePoint environment. Shawn Shell is the founder of Consejo Inc., a consultancy based in Chicago that specializes in Web-based applications, employee and partner portals as well as enterprise content management solutions. He has spent more than 20 years in IT, with the last 10 focused on content technologies. 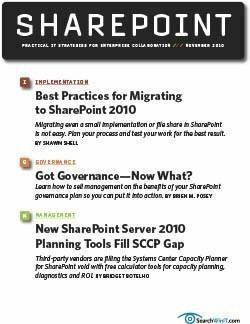 Shell is a co-author of Microsoft Content Management Server 2002: A Complete Guide, published by Addison-Wesley, and he is the lead analyst/author on the CMSWatch SharePoint Report.